Blinded, bloodied, but unbowed: Libyan-born British citizen Omar Deghayes, imprisoned and tortured for years at Gitmo, seen here shortly before his release. Omar Deghayes had no face mask when he was bound in chains and buried beneath a scrum of armored guards. Pinned down and unable to flee or protect himself, Deghayes felt a pair of fingers probe into his eye sockets. As the assailant, his fingers forged by sadistic purpose into implements of mutilation, tore and gouged at his eyes, Deghayes suppressed the scream that was gathering in his throat out of determination not to concede anything to his tormentors. While Deghayes resisted in silence, the officer presiding over the torture commanded his underling to press harder. The victim was determined to resist; his jailers were determined to break him. Deghayes won that battle, but it cost him the sight in his right eye. Today, following more than six years of constant degradation and torture in the Caribbean gulag described by the flagitious gasbag Rush Limbaugh as "Club Gitmo," Deghayes is permanently disfigured. His useless eye is permanently shut and his nose, broken through repeated beatings, is visibly scarred and noticeably skewed to his right. Omar's hideous wounds are tokens of honor attesting to his victory in what was truly a holy war against the world's most powerful terrorist syndicate, the United States Government. "A lot of the things in his character seem to have deepened, like rebellion and resistance and not accepting oppression," comments Omar's brother Abubaker in describing the changes wrought by six years of imprisonment and abuse. "I think they became more rooted in him rather than being beaten out of him." The seeds of Omar's admirably defiant personality were probably planted by the example of his father, a Libyan attorney who distinguished himself as an enemy of Gaddhafi's regime and was murdered by the dictator's secret police as a result. At one point, Libyan and American intelligence agents engaged in a bidding war to buy Deghayes from the bounty hunters who had captured him. It's difficult to imagine that Omar's suffering would have been much worse had the Libyans won that auction. This is a man: Omar Deghayes, survivor of Washington's Cuban gulag. 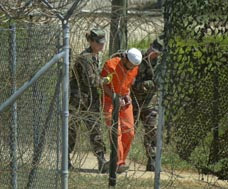 Several years ago, the Landmark Legal Foundation, a litigation firm headed by the deranged rant-radio personality Mark Levin, filed a Freedom of Information Act request to compel the Pentagon to release a report on alleged abuses committed at Gitmo. Levin, a person to and from whom lies come easily (imagine a genetic hybrid of Joseph Goebbels and Lazar Kaganovich, and you've got Levin), was lying. 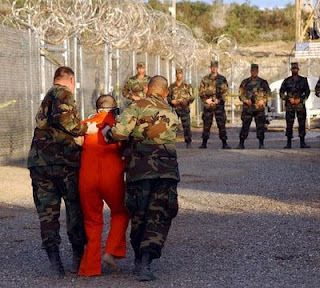 Fewer than ten percent of those detained at Gitmo had any plausibly alleged connection to terrorism of any kind, much less extensive battlefield training in the tactics of asymmetrical warfare. As a group, the detainees were innocent men who had been kidnapped, imprisoned, and abused for years without any prospect of relief. It is hardly surprising that people in such circumstances would become violent and desperate. Nor should it come as a shock to us that at least some of those who had no proven terrorist affiliations before being sent to Gitmo declared war on the government that had abused them once they were released. Deghayes was among the Gitmo detainees who "attacked" their armed captors in any way they could. He was not a violent or vulgar man by disposition. Prior to being scooped up by Pakistani bounty hunters and sold to the U.S. government, Deghayes had been a peaceful, unassuming man, an entrepreneur who was devoted to his religion and studying to become a lawyer. He had done nothing to merit his imprisonment, let alone the constant, dehumanizing mistreatment he suffered from the moment he was stuffed, hooded and shackled, into a military transport plane bound for the former Soviet air base in Bagram, Afghanistan, where he was imprisoned before being sent to Gitmo. The partial blinding he suffered -- he never regained the vision in his right eye -- was retaliation for his persistent defiance. When guards would assault him, Deghayes would fight back -- as hard as he could, however he could, for as long as he could. When they pumped pepper spray into his cell by way of the "bean-hole," Deghayes would claw at their hands and then counter-attack as viciously as he could when reaction team would swarm him in response. On the day he was blinded, Deghayes was one of several detainees who refused to surrender their pants. "Being humiliated by getting beaten up is better than giving your own trousers out," he explained later. "If I'd done those things" -- that is, meekly complied with whatever calculated humiliation his captors chose to inflict on him -- "I would've been really bitter now. I'm probably less bitter than anyone else because I know I gave them a really hard time." Omar actually displays an astonishing empathy for the guards who tormented him. As he describes them, they were victims of a cult-like regime of information management and milieu control. In precisely the fashion described by Hannah Arendt, the guards were subject to relentless ritual indoctrination intended to emphasize their "historic, grandiose, unique" role in a world-historic conflict, and encouraged to invert their pity from their victims to themselves. Deghayes expresses something akin to pity for those who imprisoned him: They willingly surrendered something they weren't able to beat out of him. 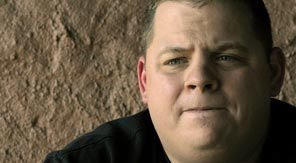 Brandon Neely, who served as a prison guard at Gitmo, recalls how he and his comrades were marinated in hatred and permitted to indulge their sadistic impulses at the expense of the helpless men imprisoned there. To understand the depth of the indoctrination and the potency of the hatred instilled in the guards it's useful to consider the case of Sean Baker, an Army Specialist who was nearly beaten to death by his comrades during an IRF training drill. Baker, clad in the same orange jumpsuit worn by detainees, was dragged from the cell by an IRF "extraction team." He had been given a "safety word" -- "red" -- to use if the drill became too intense. He desperately spat out that "safety word" as his head was repeatedly slammed against the stainless steel floor while one of his assailants tried to suffocate him. Despite the fact that all "extractions" were videotaped, the record of this incident -- conveniently, and predictably -- disappeared. After it was finally established that Baker was one of "us" rather than "them," Baker was flown to the Portsmouth Naval Medical Center in Virginia, where he was diagnosed with a severe concussion. For years after the experience, Baker suffered from seizures as a result of a beating he'd received at the hands of his colleagues -- people conditioned to treat their victims as untermenschen. While Brandon Neely escaped the kind of physical trauma that now blights Sean Baker's life, he is invisibly scarred by the memory of the things he was ordered and permitted to do to helpless human beings. "The stuff I did and the stuff I saw was just wrong," Neely told the AP a year ago, when it was assumed -- incorrectly -- that the Obama administration would be closing down Gitmo within a year. Most of the guards were in or just out of their teenage years, brimming with post-adolescent aggression and suffused with a faux-patriotic desire to avenge 9/11 by beating or otherwise molesting any Muslim on which they could lay their hands. The guards were told that the confused, terrified men who came stumbling out of military transport planes with hoods over their heads and hands and feet in shackles were "the worst terrorists in the world," Neely recalls, and they were given permission -- usually oblique, sometimes explicit -- to treat them any way that seemed fit. On his first day of guard duty, Neely was escorting a prisoner to a cell when the elderly man balked. Neely responded to this faint gesture of resistance by shoving the shackled man face-first into the ground. Each time the terrified man tried to get to his feet, Neely slammed him back to the floor. Eventually the prisoner was hog-tied and left immobilized for several hours in direct sunlight. 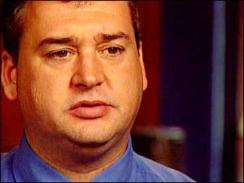 At the time, thanks to the indoctrination he'd received, Neely was convinced that the prisoner was using his "terrorist training" to attack him. He later learned that the old man had put up what feeble resistance he could out of the belief that he was facing immediate execution. For Commissar Levin, the take-away from this incident would be that Neely was among the "heroic" guards who had been assaulted by a prisoner. Neely, who is now a law enforcement officer (a career path being pursued by many former Gitmo personnel -- contemplate that fact for a second), obviously knows better. A few months ago, Neely traveled to England to seek reconciliation with two former Gitmo detainees, Ruhal Ahmed and Shafiq Rasul. The meeting was arranged by way of Rasul's Facebook page. Ahmed and Rasul were not terrorists of any kind; they had gone to Afghanistan on a recreational tour that could be referred to as "A Passage to Bangkok" (they were indulging in the "fragrance of Afghanistan," as it were). Despite having more in common with Cheech and Chong or Harold and Kumar than Osama bin Laden and Mullah Omar, the duo was corralled by the Northern Alliance and sold into American custody. Brandon's intent was to apologize for his complicity in the crimes committed at Gitmo. His victims -- displaying the virtue forgiveness that is a central tenet of Christianity, even if it is alien to the teachings of contemporary Ecclesio-Leninists -- treated him with kindness, forebearance, and friendship. Neely grew up in a multi-generational military family in Texas. After his duty in Guantanamo he served in Iraq. As any honest person would, he eventually recognized that the occupation of that country is illegal, immoral, and unsupportable. To his considerable credit, he refused to return to active duty in 2007 when his Individual Ready Reserve unit was called up for another deployment to Iraq. Just as commendable is Neely's refusal to be bound by the unenforceable non-disclosure document he was compelled to sign before leaving Guantanamo. That document has the same legal and moral authority possessed by similar confidentiality oaths taken by members of other criminal cliques, but it has successfully intimidated other former Gitmo guards into silence. As a younger man, Brandon Neely allowed himself to be transmuted into an instrument of State-sanctioned criminal violence. By making amends to some of the innocent people he helped to brutalize, Neely is reclaiming his individual humanity. That is something Omar Deghayes, for all he suffered at the hands of Neely's comrades, never surrendered. May God grant us all ten times the strength of Omar Deghayes. Those of us who love liberty and who will fight to restore it in America are going to need it much sooner than we think. This is an amazing story that I didn't know -- not something one is going to read about in CIA-administered organs such as the WaPo and the NYT. Breaks my heart to see what this country has come to. No WMDs' were ever found--Not that they actually existed. The invasion was a done deal long before it happened, Billions lost in shady contracting deals, personal liberties infringed, private contractors shooting up innocent people without accountability. And to top it off, sadistic chicken hawks like Limbaugh, Levin, Hannity and others glorifying in the torture and death of people held persona non gratia over the public airwaves. I pray the for hastening of the second coming, so the King of kings will stop this madness, and execute perfect judgment on those who have abused power in the name of patriotism and profit, and bring healing in his wings for those who suffered under this tyranny. "Thou shalt love the Lord thy God with all thy heart, and with all thy soul, and with all thy strength, and with all thy mind; and thy neighbour as thyself." liberranter is correct, those of us who love liberty will soon be next. Something wicked this way comes... Resistance must start at home. Parents must ensure their children never get beguiled by the State's lies of "duty, honor, country". Yet we must teach our children the skills of marksmanship, tactics, caching, etc. But most importantly we must teach them the spirit of liberty and the courage to defend it. Iraq was not about OIL. What if all this war, this crusade, to use Mr Bush's term, in Afghanistan and Iraq and now with Mr Obama in Yemen and elsewhere, is not what the American people are told it is about? What if all those boys from the South and elsewhere who now have no arms and legs, who are buried in Arlington, what if that is all about something else? What was done at Abu Ghraib, at GITMO, at the base in Afghanistan, all of the EVIL, the CIA etc were trained by Israelis. Trained in this sickness of torture. Pat Buchanan knew it was untrue what the neocons were claiming. Justin Raimondo's questions got him fired by Ariana Huffington. Which is a compliment to his decency. One need not be puzzled any longer as to why good Christian young men and women were able, so easily, to torment their fellow human beings. It was the guiding hand from Tel Aviv. They TRAINED these young people in this and they and their allies in our government are the true culprits not Lyndie England. Fear not the path of the truth because of the lack of people walking on it. The Jews were a people chosen by God for holiness; their Book, the Torah, is a masterpiece of wisdom. They were chosen to give birth to the Messiah. Nothing could be more dangerous to the evil plans of Satan, the Prince of This World, and therefore I believe Satan has directed the full force of his cunning and deception against the Jews. Secular Zionists are doing the work of Satan, not of God, and do not even know it, since they keep justifying everything they do by their being the Chosen People, given license, they think, to do whatever they please through a Covenant with God. A few Jews, a small minority, see the truth and are distressed. The vast majority are doing or condoning unspeakable evil, and cannot see it. Just like the concentration-camp guards Mr. Grigg and Hannah Arendt describe, they commit the most vile atrocities and call themselves the victims. Because of the media and propaganda power they have in America, we are becoming just like them. Read again the links I gave which show how they control virtually ALL the media throughout the world, and thereby set the tone of world culture. The whole world is being corrupted and degraded by these people, Chosen by God, but doing the work of Satan. What a tragedy. The only consolation I have is the declaration of the Messiah (a Jew) to Pilate: "My Kingdom is NOT of this world." So it is futile for us to hope otherwise. Satan rules here, God rules there. Our task is to do the best we can, recognizing that this world is a learning and a testing ground to prepare us for something better. Mr. Grigg, another powerful and distressing story. But one with a ray of hope: At least Brandon Neely had the guts to face his actions and apologize, and at least his Muslim victims had the grace to forgive him. I see the Holy Spirit at work. I see the roses of divine love bravely blossoming in the cesspit of this world, in spite of the strenuous efforts of Levin and Limbaugh and their ilk to smother them. Thank you. WHY ISN'T THIS ON EVERY TELEVISON STATION IN THE COUNTRY? WHEN WILL THE AMERICAN PUBLIC RISE UP AND END THIS HORROR? Mimi, you've hit on something, like so many others, that makes you scratch your head it's so obvious an yet you wonder why it doesn't get more "air". And THAT is the rub right. Mainstream media is for all intents and purposes a propaganda tentacle of the government. It is cozy to the FedGov because of the "special" licenses and largese it receives from the hand of its true "master". Why jeopardize access to da Prez, da Military, and those swanky get together press conferences etc. etc. ad nauseum? When you have a corporation to run, shiny faces with perfect teeth to pay for, shekels to be made, and slaves in flyover country to keep hypnotized, you get along to keep along. As for Mr. Truth, Justice and the American way? Well, he can take his usual seat at the back of the bus. Oh, and by the way. Good for Brandon! At least he had the courage and fortitude to seek forgiveness. That our "leaders", devils that they are, don't, speaks volumes about their character no matter the fairy tales they vomit from their pie holes. Dear William N. Grigg, one thing the major media (and typically the so-called "alternative media") almost always do that I find to be appalling--yet expected given their status as mouthpieces of the U.S. government--is that they treat the torture the U.S. government engages in as involving waterboarding, embarrassment, loud music, bright lights, and cold cells. I realize you have highlighted a number of cases where this is not so, e.g., in this case. But even you usually don't go far enough in reminding people the true level of horror, brutality and depravity the U.S. government engages in regarding the tortures they inflict upon innocent people. Though I commend you for, e.g., bringing up the U.S. government's outsourcing of torture via "extraordinary rendition" to its client-state of Uzbekistan. I think it would be great for you to write an article that brings up many of the truly horrific tortures that the U.S. government has engaged in, that way each time you write regarding the mistreatment of innocent prisoners you can include a short paragraph explaining the level of depravity this really involves and the scale of it, while linking to your compendium of such cases, in order to remind people that we're not talking about merely giving people a humiliating experience, as Rush Limbaugh would have people believe. Moreover, not just to you, Mr. Grigg, but to everyone who reads this post, let us not forget that those who control the U.S. government staged the 9/11 attacks from beginning to end in order to obtain more funding, power and control, both domestically and in being able to take over foreign countries in furtherance of the establishment's self-termed New World Order world government and mandatory world religion, with enforced population reduction (i.e., mass-murder) of most of the world's population via world war and biological releases--said future depopulation not being motivated out of any concern for the environment, since these are the destroyers of the world, but rather in order to cement their power. So take heart: if the laws of physics be for us, who can be against us? We are given a view to what many among us are capable of doing when directed by the state to allow their nether beings to surface. What will they do when they are told to do the same to "domestic enemies", ie, those who are labeled this way because they have a desire for freedom? Sadly, we know the answer, for the dehumanization process for all of the enforcers of leviathan proceeds apace, even today, with sadistic human refuse referred to as "heroes" for abusing "enemies". Just as Nazi terror was visited upon common Germans and Communist terror visited upon common Russians, so, to, will the evil of our own state be ultimately visited upon all of us. This is history. This is reality. It will be our reality if we do not act to terminate this abomination. This story made me weep. Stories like this are what I think of -- and have been thinking of for several years -- when I hear someone say that Republicans are for smaller government than the Democrats. The hell they are. Unfortunately, just as the Republicans have historically ratified Democratic socialist spending, Democrat Obama is ratifying the precedents of shredding the Bill of Rights done by the Bush administration. I pledge that I will not waste my vote ever again on a neo-con war-monger. As Phillip Zimbardo's Stanford Prison Experiment showed - we all have the capability and capacity for the kind of depravity that is slowly being revealed to have been perpetrated by our government. Control the environment and parameters of reward/punishment and you can get most people to do any vile thing you task them with. It continues to amaze me that the internet is still as open as it is, the dissemination of truth found here and nowhere else (certainly not the fourth estate) has to be seen as the ultimate threat. I would say that this is an especially dark period of amerikan history then again, almost from the beginning of this country it has engaged in such undertakings. It is the nature of government. Many argue the ideology/theology that might be driving it, however the inescapable fact is that the common factor is, and always has been, money and power. Lack of the former is the only restraint on the latter (they wipe their asses with constitutions which only provide a tissue thin facade of restraint). The only way to contain Leviathan is to starve it. Unfortunately, it has grown to such proportions that even to starve it will require strategic 'amputations'. Yes, we have to face the stark reality that there are those in public life who need to assume 'ambient temperature' by any and all means - or more directly, sufficient numbers of those in power need to be eliminated or driven from our shores. If that ever happens and the country or such fragments as continue to exist intact will have to demand, with force of arms, that the gov't will not tax the incomes or property of the people and that it will honor the rights of the individual without regard for 'society's' plaintive wailings. At that point we cannot allow Leviathan to become fat once again at our expense. When enough people are frustrated and angry enough to start hanging the bastards - then we might restore the American dream. That reminds me of George Carlin when he said that to accept the American Dream you had to be asleep to believe it. LOL! You're right. Sad to say but it's true that unless THEY are told "NO", even up to the point of delivering them off this mortal coil, they won't ever stop. That's not something I look forward to but expect will happen. Wow, no--the operative word here is 'citizen.' British, I believe? Hmm, if he were a US citizen, your remarks might have merit. Be still and be enlightened. The operative words here are "innocent person" -- with emphasis on the latter. The same constitutional provision that refers to "citizens of the United States" (Amendment XIV) specifies, in relevant part, "...nor shall any State deprive any person of life, liberty, or property, without due process of law; nor deny to any person within its jurisdiction the equal protection of the laws." This protection of the individual "person" applies everywhere the government in Washington claims jurisdiction. It doesn't apply only to "citizens of the United States." And I don't think any reasonable person could consider the deliberate, vicious blinding of a detainee (one who hadn't even been charged with an offense) to be anything other than a violation of numerous laws (among them the Eighth Amendment's ban on "cruel and unusual punishment"). "...This protection of the individual "person" applies everywhere the government in Washington claims jurisdiction. It doesn't apply only to "citizens of the United States."" I guess, so far, we're wrong though huh? The Constitution really is just a scrap of paper. America, home of the usurped.